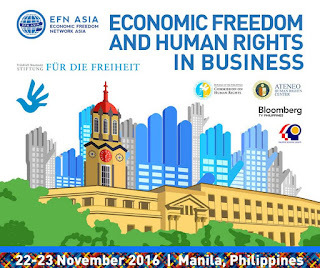 The Economic Freedom Network (EFN) Asia conference 2016 at Dusit Thani Hotel in Makati ended last Wednesday. Thanks again FNF and EFN for another wonderful conference. Here are some tweets from #efnasia2016 and my own thoughts about the event. 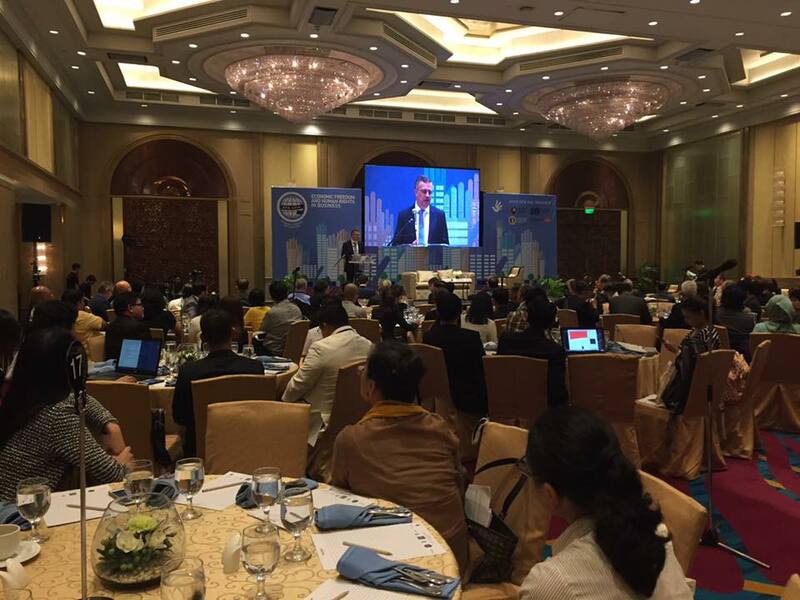 Protection of human rights is part and parcel of EU policy – Walter van Hattum, EU Delegation to the Philippines. It's a responsibilty of businesses to respect human rights... It is state duty to protect and defend human rights in its territory. Nobody can seriously suggest that businesses can opt in and out of respecting human rights as they wish... There is legal obligation for businesses to respect HR. Businesses should be as transparent as possible so they will be less likely to be attacked by false news. Business leaders are often uncomfortable explaining to the public how they work. It's understandable but unwise. -- Markus Leöning, former Himan Rights Commissioner in Germany. For me, among the important human rights of the people is freedom to choose in the market place, freedom to sell or not sell, freedom to buy or not buy. Political human rights like the right or freedom from theft (especially organized criminals), murders, prosecution and harassment, that is where the state should come in. A minimal government focused on enforcing the rule of law, enforcing contracts between and among people, is consistent with economic freedom and human rights protection. That minimal govt should have no business creating and expanding lots of endless welfarist programs. Prosperity is not an entitlement or privilege. Lazy and irresponsible have no right to a prosperous life, they deserve poverty. Politically incorrect statement, as usual. Rule of law means the law applies equally to unequal people. So the law should apply to both rich and poor people, to big/giant and small firms. A law or contract can be written, verbal, done by govt or private entities. Basic human rights then means that people have access to such equality before the law. Below, Rainer Heufers moderating, with Wan Saiful Wan Jan, Peter Kompalla, Rishi Sher Singh, Dr. Manzoor Ahmad in the new panel. Good point. Some westerners may consider temporary child labor as HR violation already but for some households, it is ok and necessary. If a sole family breadwinner is gone for instance, the young need to work to help sustain the family. 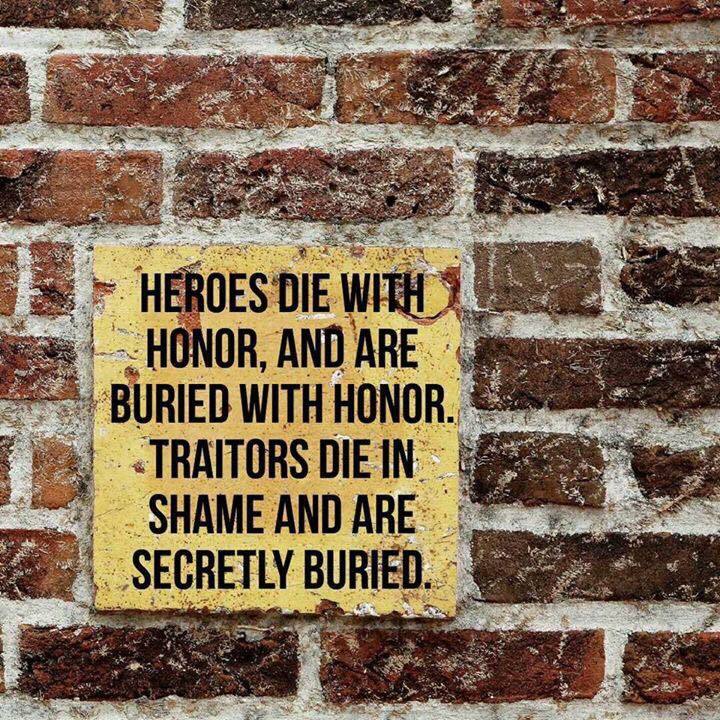 Harsh but necessary. Business of business is indeed business! Inclusive of profitability for investors, benefit to consumers, add values to society. Better protection of human rights, improved environmental quality, higher sense of justice, necessary social value additions. Value added products, economic and social, become affordable with prosperity, and necessity in a free competitive market. I think corporate branding will help global firms stay the course in HR and econ freedom protection, respecting #ruleOfLaw. Firms would dislike to be associated with bad products, bad services, bad corporate image. So they will try to be as transparent as possible, to be accountable to their products and practices. Transparency is good protection vs negative image/attacks. Session 2 Panel speakers: H.E. Franz Jessen of EU, Dr. Lee Taekyu of KERI, and Atty. Arpee Santiago of Ateneo Human rights Center. Govt and countries don't trade, individuals and businesses do. Govt negotiating trade treaties leading to anti-trade backlash. Free trade is voluntary, so win win. Govt negotiations may liberalise trade, but legitimises govt in trade n economy, corruption. Environment, labour or human rights standards in national trade treaties, focus on outcomes, give advantage to large, richer cos! Society / govt benefit most if they adopt unilateral free trade. All politics is local, a local decision will minimise backlash. Govt negotiating trade, inevitably adopt export is good, import is bad outlook. Free trade is beneficial when govt has no role. Access to internet can't be a "Right". Political rights are negative rights. Any +ive right paid for by others can't be a RIGHT. As usual, I agree with Barun's ideas and observations: unilateral trade liberalization; countries and governments do not trade with each other, people do; so governments, national and multilateral, should step back from trade negotiations as much as possible. Let companies and people organizations negotiate with their suppliers and consumers abroad and keep prices low via low or zero tariff, minimal non-tariff barriers. 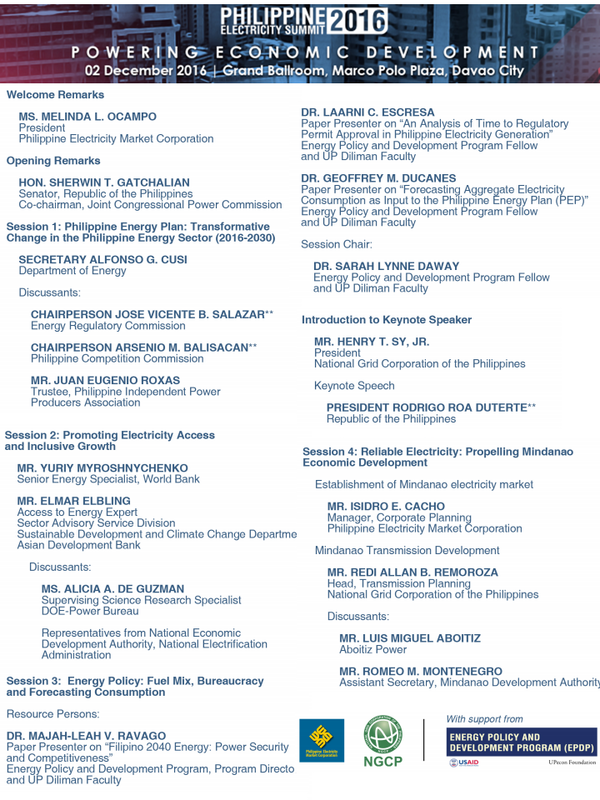 The annual Electricity Summit jointly organized by the Philippine Electricity Market Corporation (PEMC) and the National Grid Corporation of the Philippines (NGCP) will be held next week in Davao City, the home of President Duterte. PEMC is the market operator, the Wholesale Electricity Spot Market (WESM) while NGCP is the system operator. 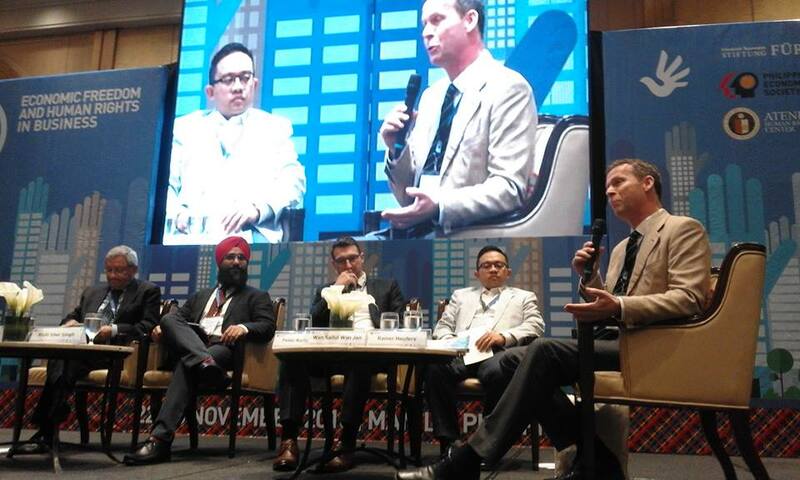 I attended theElectricity Summit 2015 held at the Crowne Plaza in Ortigas. Compared to most conferences that I attend, it was an odd or weird one. The organizers and speakers are the energy regulators (DOE, ERC), market operator and system operator, and the audience are the regulated market players. So during the open forum, I think the audience were hesitant to ask critical questions and comments to the guys who regulate them and operate the system for them. I think I stood 2 or 3 times to ask questions because the huge conference hall has a generally friendly atmosphere to the organizers. 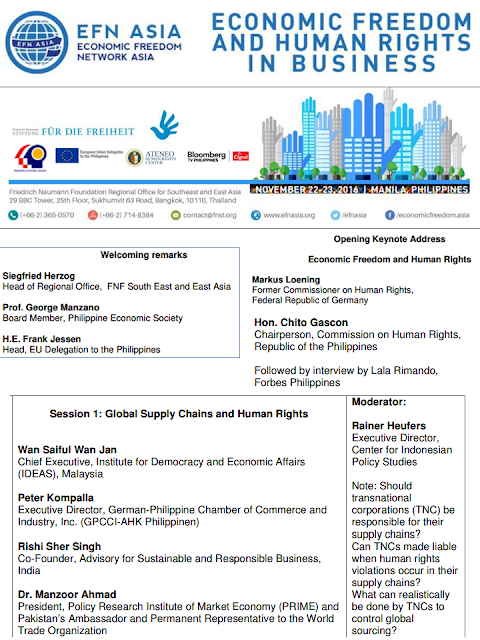 The program this year is a bit different mainly because (1) EPDP is involved, an independent institute, (2) there are speakers from the WB and ADB, and (3) the President is a keynote speaker. Last year, among the key speakers were from (1) the ASEAN Power Grid, (2) the International Energy Agency (IEA), and (3) Mr. MacDonald, the Australian consultant who justified the PEMC structure of many government representatives in the board and still call it an "independent" agency. 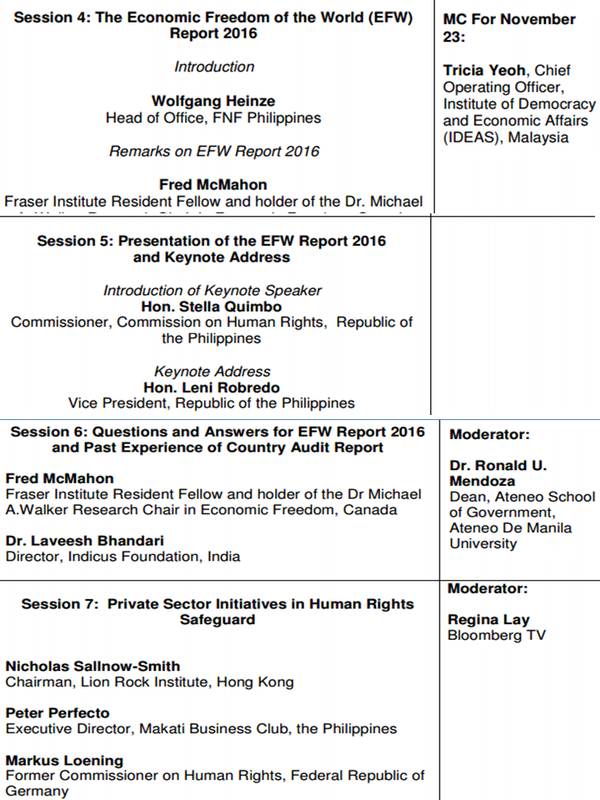 Provisional program of Summit 2016 as of November 17. 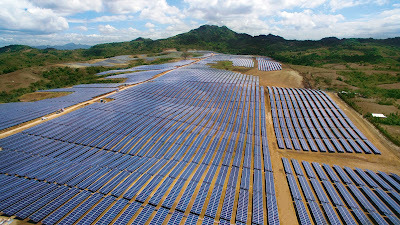 What will be new there will be the proposed electricity market and transmission connection for Mindanao. 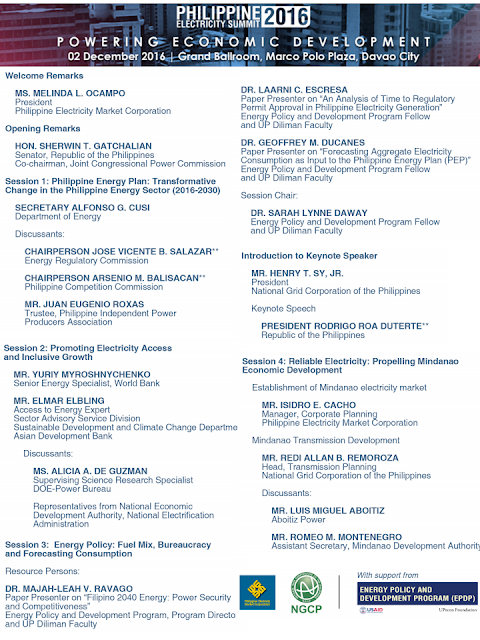 Will the session also tackle the privatization of huge hydro power plants in Mindanao, the Agus-Pulangi plants, others? I doubt it. These plants are still under another government corporation, the Power Sector Assets and Liabilities Management Corp. (PSALM). Registration is P15,000 per head, not cheap. People from Metro Manila, Visayas must also fly to Davao and get a hotel room for a night or two. Meanwhile, PEMC sent me their latest press release with a good news: the Effective Settlement Spot Prices (ESSPs) in WESM further fell from PhP2.86/kWH in September to PhP2.48/kWH in October 2016 billing period. Good news, indeed. ESSPs are average prices paid by wholesale customers for energy purchased from WESM. Meralco has been getting more of their power supply from WESM over the past two or three months, something like 15-20% of their power supply. Mura eh, good decision. Supply – demand dynamics. Higher supply, more competition among gencos, lower prices. Limited supply while demand remains high, higher prices. This is the power generation mix for October 2016 in the Luzon-Visayas grids, PEMC data. 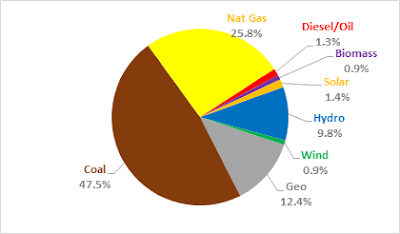 Will the planet saviours who keep insisting on "more wind-solar please to save the planet" be happy with frequent, long hours of blackouts daily, more candles and noisy gensets 365 days a year? Solar + wind can only supply 2.3% of the total electricity need in Luzon-Visayas grids including Metro Manila. Meanwhile, PEMC will not report that there is a bad news to low ESSPs -- that the FIT-All (feed in tariff allowance) will naturally rise big time next year. 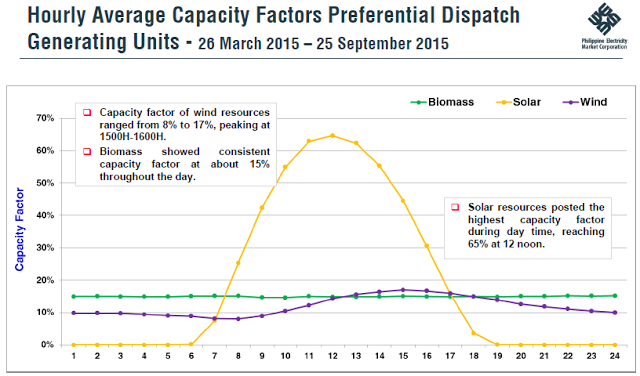 So, since the collections from WESM are low because of low ESSPs while the total FIT collections will be high as more solar-wind are added to the grid with their expensive guaranteed price (for 20 years, mind you), FIT-All will naturally rise. From 4 centavos/kWh in 2015 to 12.40 centavos/kWh this year, to about 20 centavos/kWh in 2017? If we combine these: (a) FIT under-recoveries in 2015 because of the low FIT-All of 4 centavos + (b) FIT under-recoveries in 2016 because of low ESSPs and insufficient 12.40 centavos + (c) more expensive solar-wind power added to the grid, the resulting FIT-All by 2017 will be high. The FIT administrator is another government firm that owns the country's grid system and assets, the National Transmission Corporation (Transco). 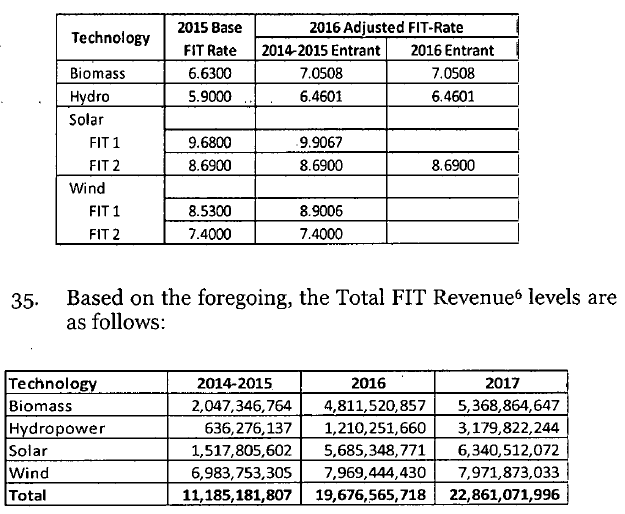 I do not know yet how much Transco has petitioned the ERC for the FIT-All next year. Again, my bottomline: government interventions in setting the energy mix, in setting fixed and guaranteed pricing for the variable renewables (solar, wind, biomass, run-of-river or small hydro), in granting mandatory dispatch for these renewables, are all wrong. They can lead to more expensive electricity, more unstable supply and "brownouts-friendly" electricity. 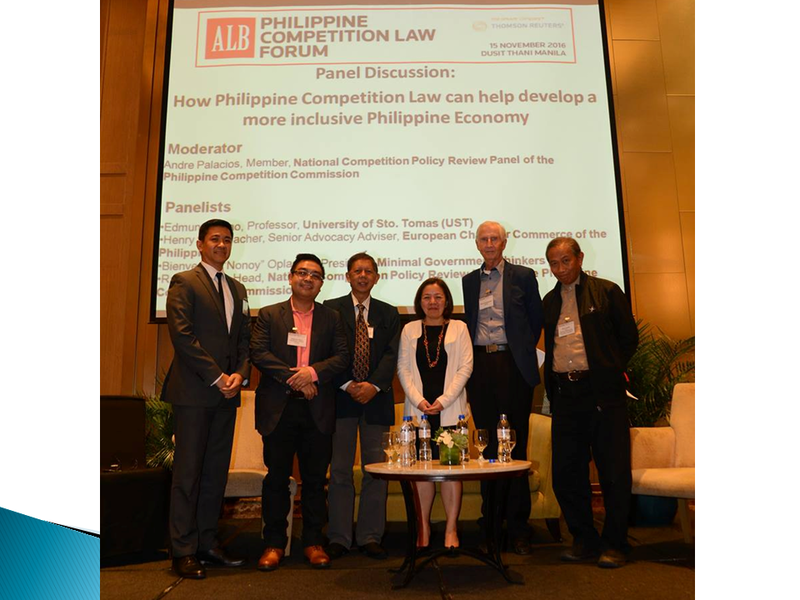 Last week, I was one of four speakers on the Asian Legal Business (ALB) and Thomson-Reuters' forum on the Competition Policy. 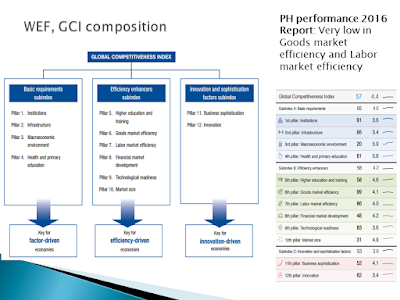 I started with the World Economic Forum (WEF) Global Competitiveness Index (GCI) 2016 report. Performance of some ASEAN countries and neighbors. The Philippines' overall rank has declined by 10 even though the decline in score was not that big, from 4.39 in 2015 to 4.36 in 2016. This means that some countries have significantly improved their scores relative to the Philippines. I also showed the various government agencies that give various permits and/or franchises. A franchise is often a monopoly for X number of years, slide borrowed from Andre Palacios' earlier presentation at the PES conference. 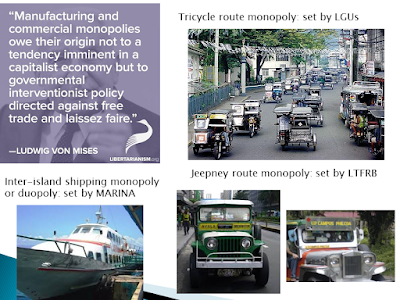 Here are examples of government agencies that create monopoly or oligopoly privileges. I asked this question at the audience, true or false? A few said True while none said False. Two hands. Which one provides real welfare to the people? 1. Very often, the purpose of government is to expand government. 2. Newton’s 3rd law of motion revised: For every govt intervention, there is an equal opposite distortion. 3. Improve market efficiency and competition not so much what govt. should do/subsidize but rather, what govt. 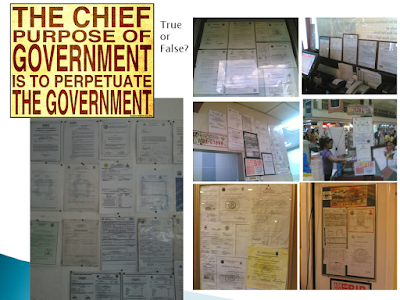 should NOT do  Less bureaucracies, taxes, fees, regulations, prohibitions. 4. 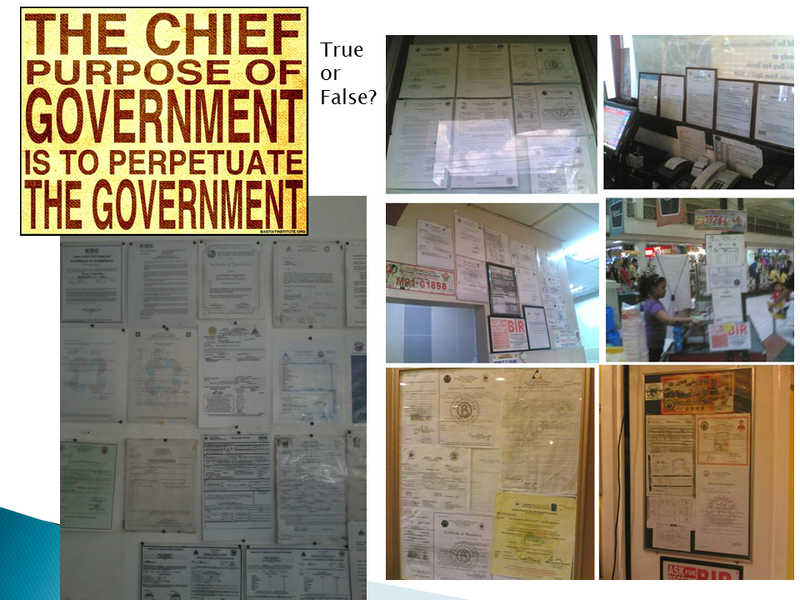 Not so much good governance of BIG government but less governance. 5. Heed Adam Smith’s ‘invisible hands’ of the market, not Keynes’ ‘grabbing hands’ of the state. From left: Andre "Raj" Palacios (moderator) of the Competition Review Committee (CRC), Moy Tayao of UST Pol. Sci. department, me, Thomson-Reuters Manila head, Henry Schumacher of the European Chamber of Commerce, and Raul Fabella, Chair of the CRC, also of UPSE. 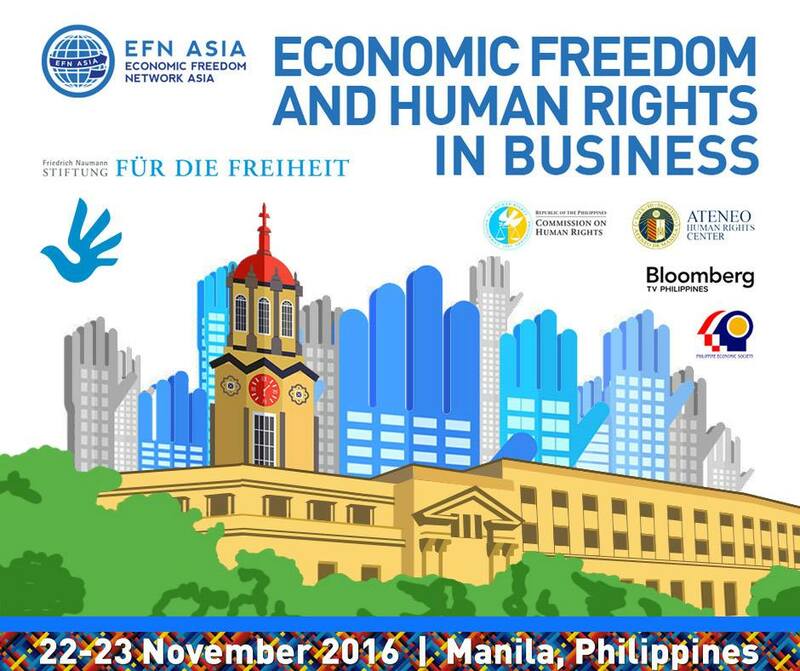 The Economic Freedom Network (EFN) Asia conference 2016 will start in two days, November 22-23, 2016 at Dusit Thani Hotel, Makati. 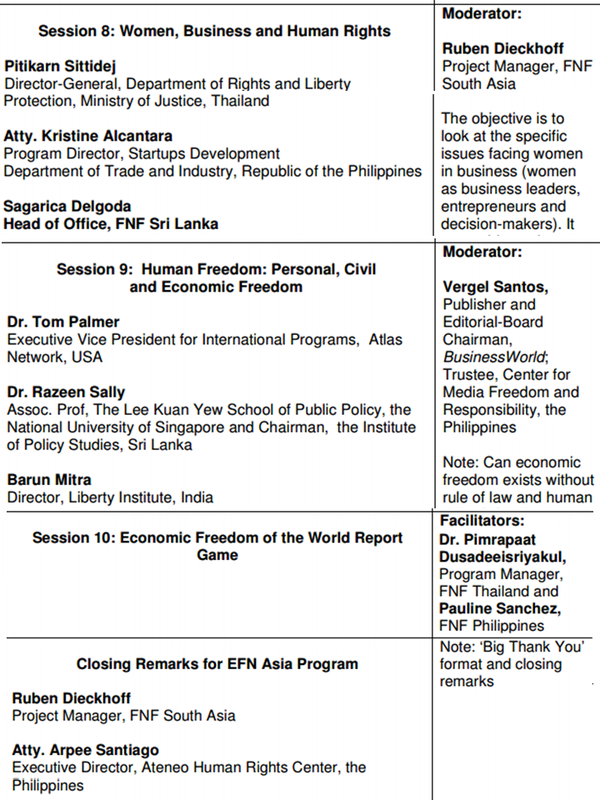 It is organised by EFN Asia and Friedrich Naumann Foundation for Freedom (FNF), with support from four organizations: the Philippine Economic Society (PES), EU Delegation to the Philippines, Ateneo Human Rights Center, and Bloomberg TV Philippines. 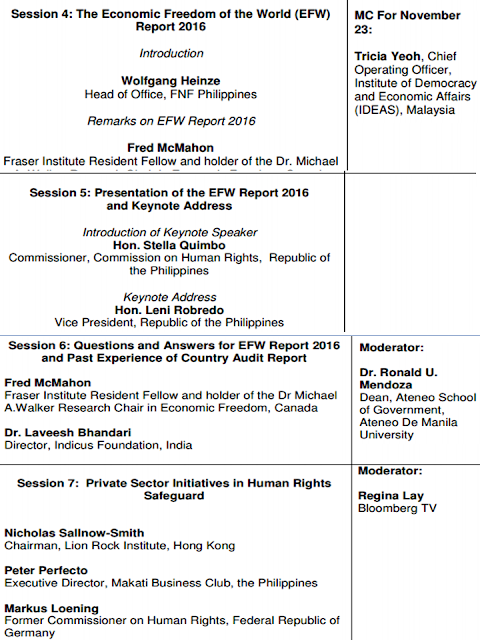 The program is here, http://efnasia.org/wp-content/uploads/2015/10/EFN-Asia-Conf-2016-Full-program-as-of-17.11.pdf. Below, I just copy-pasted the program minus the time and some space. 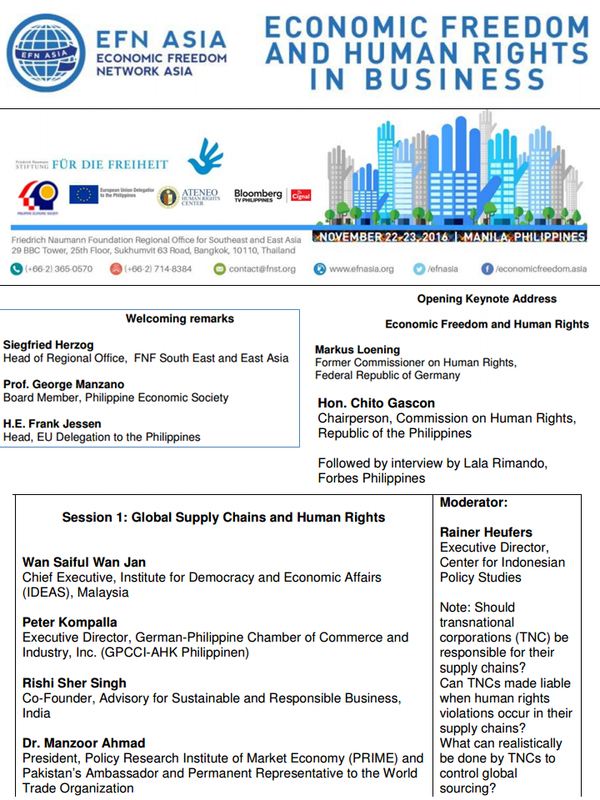 MC for Day 1 will be Minnie Salao, Program Manager, FNF - Philippines, and Pett Jarupaiboon, Regional Program Manager (Economic Freedom and Human Rights), FNF Southeast and East Asia (based in Bangkok). Good line up of speakers from many countries on Day 1. I think President Duterte's admin might raise their eyebrows on the subject of "human rights". 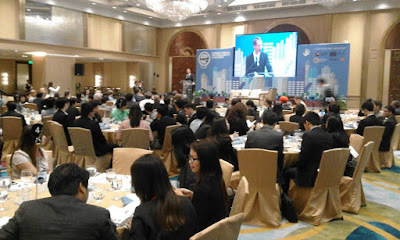 But the conference will talk less, if ever, of murders and large deaths in the on-going "drugs war" of the government, more on the conduct of business in the age of expanding trade and business globalization. Day 2 of EFN conferences are always devoted to the launching and discussion of the annual EFW reports by Fraser Institute, based in Vancouver, Canada. Fraser is almost always represented by Fred McMahon for several years now. 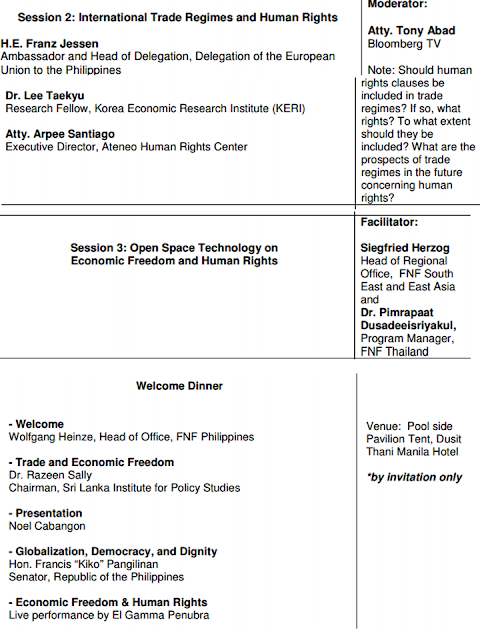 Session 9 will be a more political discourse of human rights but not necessarily mentioning the Philippines. This is because the three speakers -- Tom (US), Razeen (Sri Lanka) and Barun (India) -- are long-time fighters of individual freedom, dating back to 3 decades ago or more. Economic freedom, not economic central planning. Rule of law, not rule of men and dictators. Looking to another exciting conference next week. * This is my article in BusinessWorld last Friday. Planet Earth is estimated by geologists and other scientists to be 4.6 billion years old. In that period, the world has experienced a series of warming-cooling-warming-cooling cycles. So global warming and climate change (CC) have been there as natural (i.e., nature-made) and cyclical events. See dozens of paleo-climate data and charts that date back to thousands, millions and billions of years ago here: https://wattsupwiththat.com/paleoclimate/. Yet for decades now, we have been bombarded by the United Nations and other institutions and individuals who deny nature-made climate change and climate cycle, deny that global cooling can take place after a global warming phase. Owing to such denials, anthropogenic or “man-made” climate change can only be fought via man-made and UN-directed solutions like large-scale and endless subsidies to intermittent renewable sources. Such is the dominant global belief and being formalized during the annual UN Framework Convention on Climate Change (UNFCCC), like the Conference of Parties (COP) 22 meeting in Marrakech, Morocco from Nov. 7 to 18 this year. It is another confused document from the UN. Top 5: Floods, Droughts, Higher temperatures, Sea level rise, Storms. Next 5: Decreased precipitation, Changes in precipitation timing, Vector/water-borne diseases, Increased precipitation intensity, Desertification/land degradation. Such scenarios and proposals are very detached from the realities and needs of many countries, developed and developing alike. 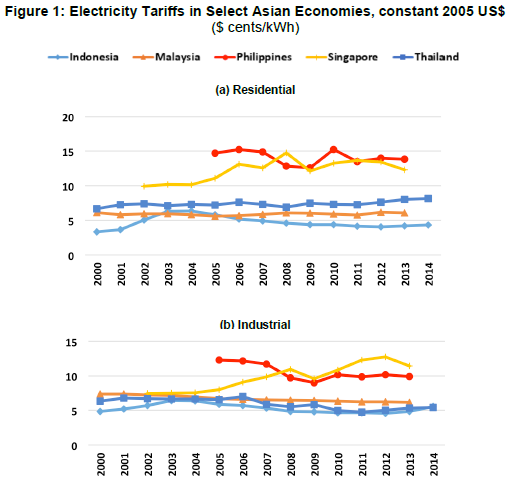 Here are the data from the Asian Development Bank (ADB) released only two weeks ago (see table). Almost all of the big and developed economies in the region have high reliance on coal and/or natural gas, among the most prominent fossil fuels in the planet. 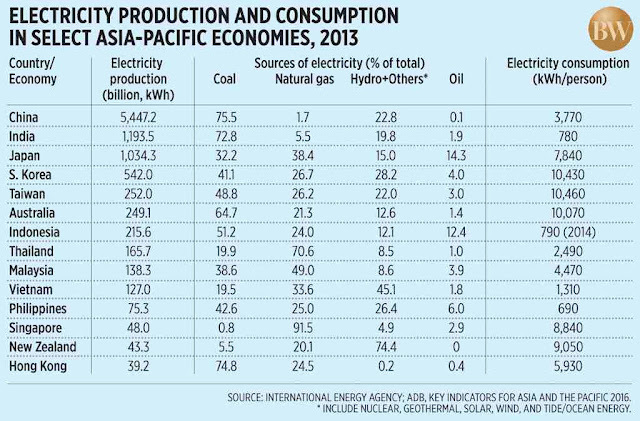 The Philippines in particular has low national electricity production compared to many of its neighbors in north and south east Asia, only 75 billion kWh in 2013. The country also has a very low per capita electricity production of only 690 kWh/person. Over the past two weeks, I have attended several conferences and meetings and the subject of “expensive electricity” and “insufficient supply of power” would crop up naturally even if the events are not specifically focused on energy. 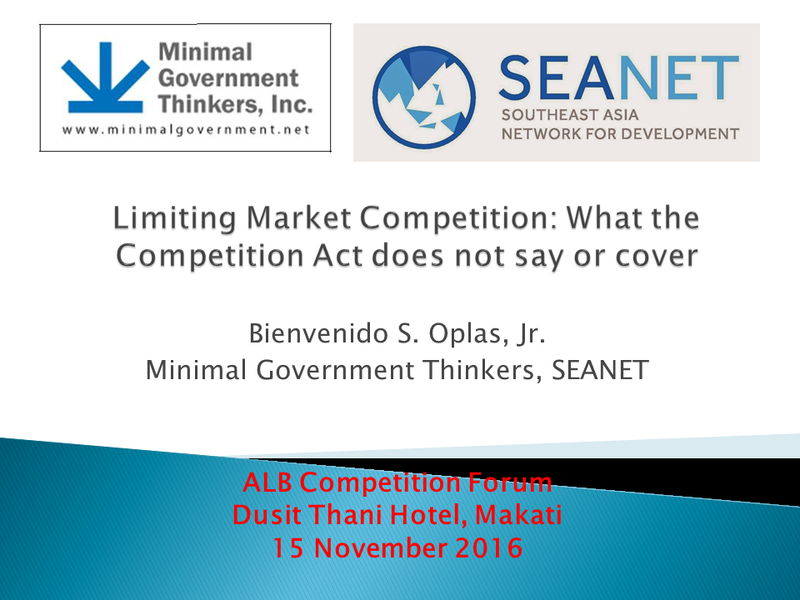 These events include the DTI’s pre-summit consultation on FTAs and manufacturing industries last Nov. 3, pre-summit consultation on innovation and competitive industries last Nov. 4. One participant said that while garments are labor-intensive, textiles are energy-intensive and they can feel the pinch of high electricity prices. Meanwhile, during the Philippine Economic Society (PES) annual conference at Novotel Cubao last Nov. 8, the two sessions on energy economics and competition policy have also touched on these subjects including competition in power generation companies and monopolies in power transmission and distribution. 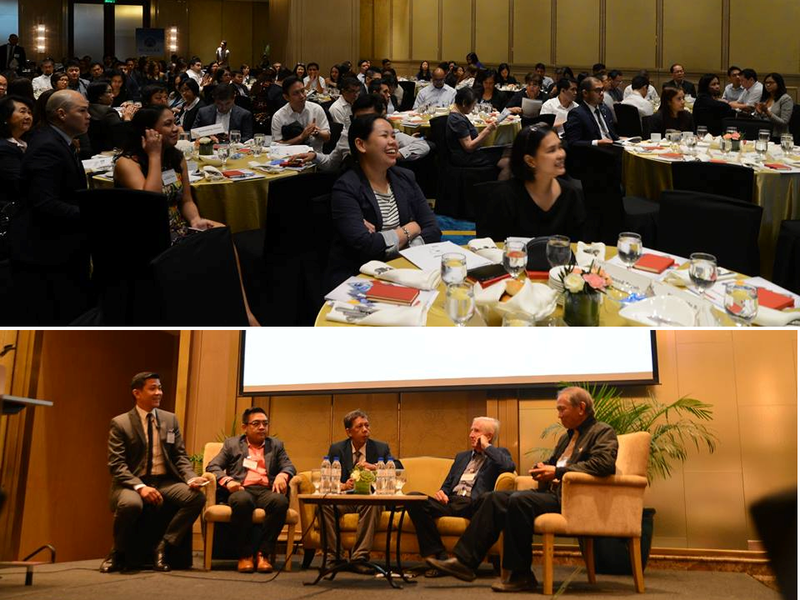 In the Agribusiness commercial legal and institutional reform (AgCLIR) roundtable at Makati Shangri-La last Nov. 11, many agri-business enterprises in the country brought up the matter of high electricity costs. Last but not the least, during the Asian Legal Business (ALB) -- Thomson Reuters’s Competition Forum at Dusit Thani in Makati City last Nov. 15, one of the speakers, Dr. Raul Fabella of UPSE mentioned pricing under monopoly and duopoly or oligopoly, like in power distribution and generation. The over-riding concern for the Philippines and other developing economies in Asia and the rest of the planet is how to hasten and sustain economic growth so that job creation and poverty alleviation can also be sustained. Having cheap and stable electricity is a major part in realizing this goal. Forcing expensive and unstable energy sources to “fight climate change” as pushed by the UN and participating governments is contradictory to the above goal. After all, climate change from warming to cooling in natural cycles did happen in the past and continues to happen today. Governments therefore, should be more realistic and not alarmist in pursuing that over-riding goal. Less ecological central planning, less energy rationing, less climate bureaucratism would be consistent with poverty alleviation. 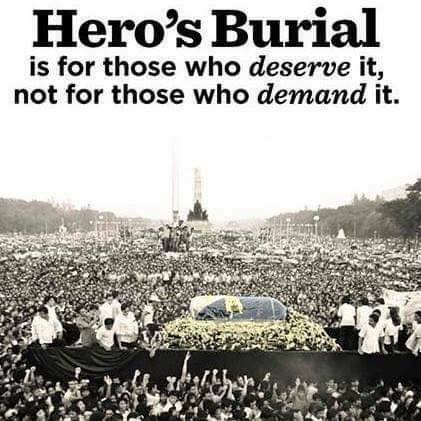 Noontime today, former dictator and President of the Philippines for 20 years (1965 to late February 1986), Ferdinand Marcos was hurriedly and secretly buried at the Libingan ng mga Bayani (LnmB, Cemetery for Heroes). Air Force choppers were used to transport the coffin, etc. and flew straight from Ilocos to LnmB. Ang bagong pangalan na nito dapat ay "Libingan ng mga Bayani, at Diktador-Kawatan". Naghalo na ang mga bayani at anti-bayani, magnanakaw at berdugo sa sementeryong iyon. Good points from Bernard Ong. 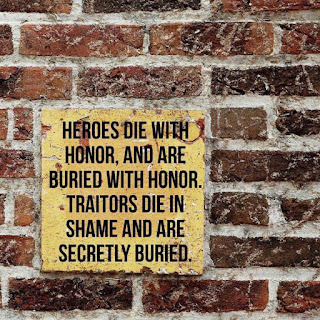 The photos and memes I just added here, taken from the web and fb. Duterte said: "Hopefully, both sides will... come to terms with the burial of former President Ferdinand Marcos.” He pretends to be above the fray and washes his hands off his lead role in Marcos restoration. He took money from the Marcos family - money stolen from the Filipino people - for his election campaign. He hid this fact during the election & did not even declare it in his SOCE (statement of campaign expenditures). Heroes' burial was half of his repayment. The other half – BongBong Marcos as VP (prelude to full Marcos restoration when he becomes president) – is still unfulfilled. Marcos caused immense misery on so many people – killings, looting scarce resources intended for social services, causing economic hardship. Duterte is smart enough to know his history but chooses to play dumb with arguments like ‘ He was only charged in civil court, he has never been convicted of any crime’. If Marcos can get away with it. Any trapo with highly-paid lawyers & friends in high places can get away with it. That’s impunity. The mindset ‘Not guilty if you’re smart enough to escape conviction’ might as well apply to Duterte himself – 1000+ Davao Death Squad killings, 4000+ EJKs in Drug War, alleged wealth stashed in deposits shielded by Bank Secrecy Law. Don’t be deceived by Duterte’s talk of “both sides”. He is firmly on one side – on the side of the dictator who killed, plundered and inflicted hardship on an entire nation. 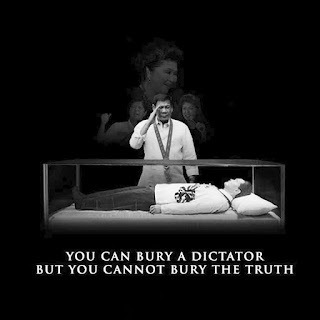 Marcos was a liar, a tyrant, a mass murderer and a thief. Duterte wants to be like him." 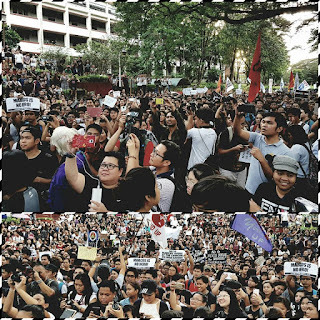 This afternoon, there have been plenty of protests and citizens mobilization protesting the treacherous and secretive burial for the late dictator. At my alma mater, UP Diliman this afternoon. 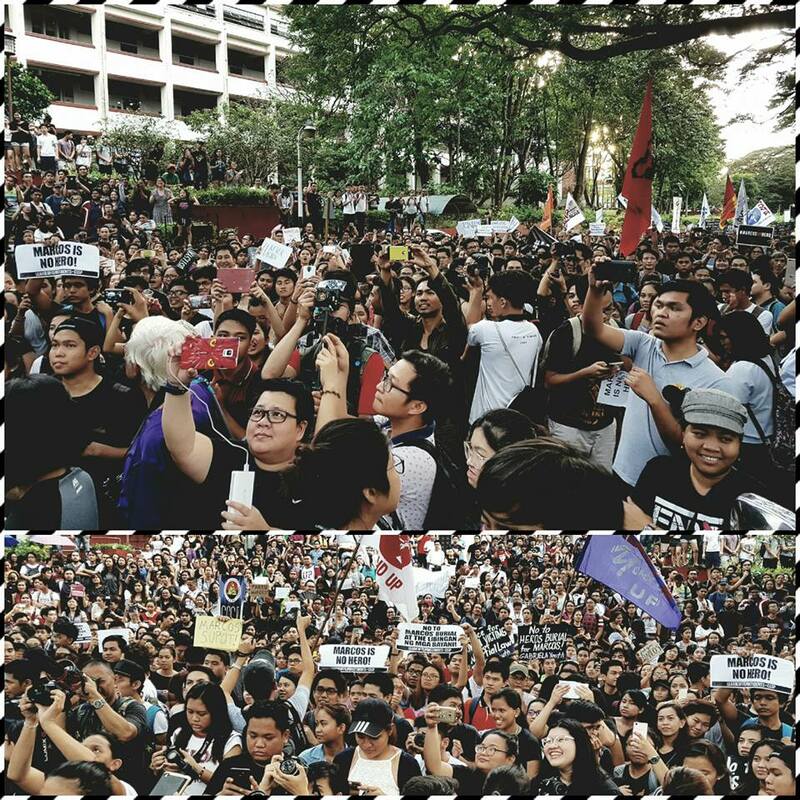 There were also huge student protests at Ateneo de Manila, UP Manila, St. Scholastica, other universities. 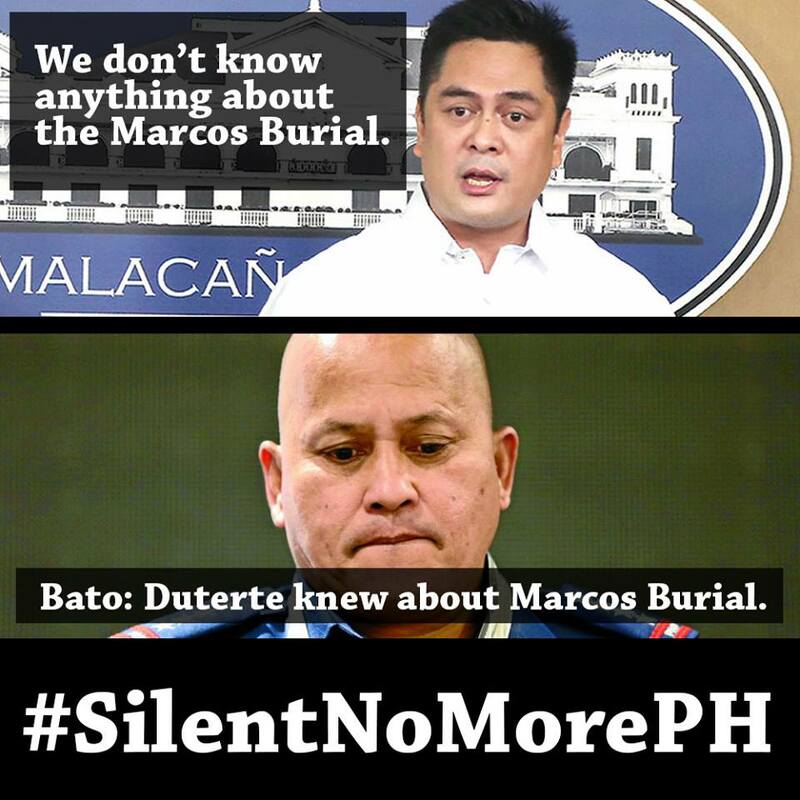 Imee Marcos and family said it was a "private burial." No, they are lying. It was a government-sponsored, taxpayers-funded burial. President Du30 ordered the Air force and other armed forces directly and he bypassed the DND Secretary? Sanay talaga sa diktadura at pasikreto mga ito. 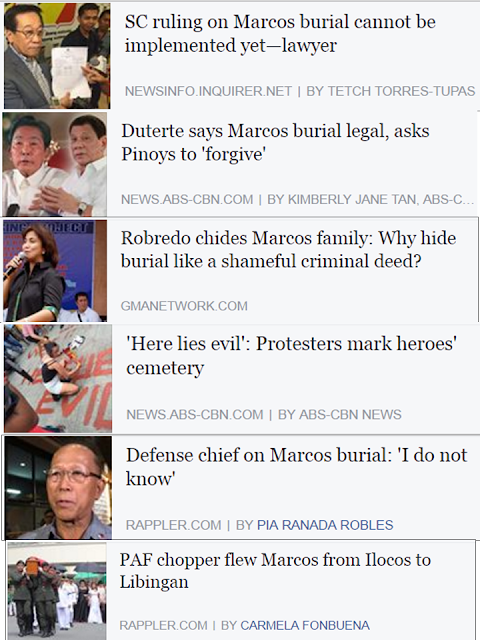 Karma for the 9 SC justices who supported the Marcos burial. Now the SC as an institution was slapped in the face by the AFP, PNP, Du30 and the Marcos family. Magsama-sama sila sa pagka walanghiya. 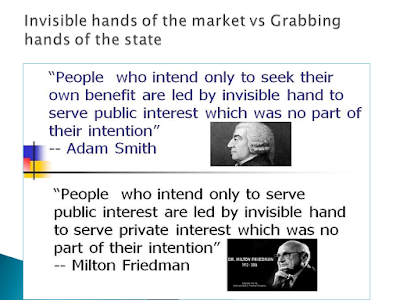 BIG government is very often big scandal, big robbery and plunder, big disrespect for the rule of law. There is a populist and persistent belief that free trade means weakening, if not, bringing about the death of local manufacturing industries because they will not be able to withstand competition from more advanced economies abroad. This belief has been repudiated many times in countries including the Philippines. And there is a new paper that repudiates this belief again. Former NEDA Secretary Dr. Cielito Habito discussed a new paper at the Department of Trade and Industry (DTI) pre-summit roundtable, based on their research at the USAID-funded Trade-Related Assistance for Development (TRADE) Project. 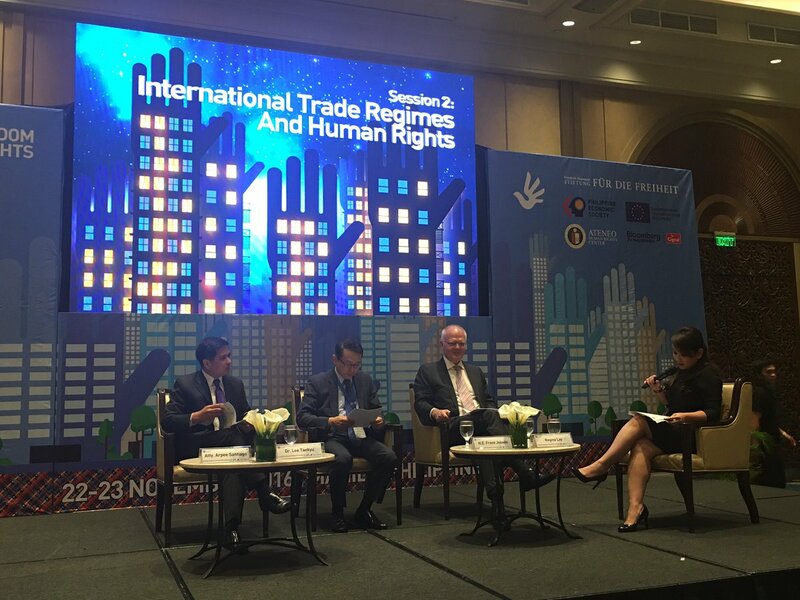 The roundtable was part of the preparations of the DTI and the Board of Investments (BoI) in an important event they are jointly organizing, the “Manufacturing Summit 2016: Trabaho at Negosyo” this coming Nov. 28-29, 2016 at the Makati Shangri-La Hotel. 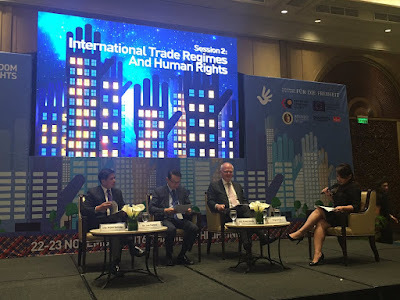 Besides plenary sessions, breakout sessions to be held will cover seven topics, one of which is International Trade Policy and Free Trade Agreements and Dr. Habito’s discussion was in preparation for this session. 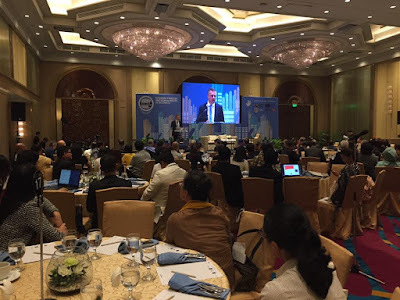 I was among those invited by the DTI for the pre-summit roundtable, thanks to Assistant Sec. Rafaelita Aldaba. In January 2010, the ASEAN Free Trade Agreement (AFTA) became operational. The import tariffs on nearly all products traded across the ASEAN-6 (Brunei, Indonesia, Malaysia, Philippines, Thailand, and Singapore) dropped to 0, some at 5% maximum. 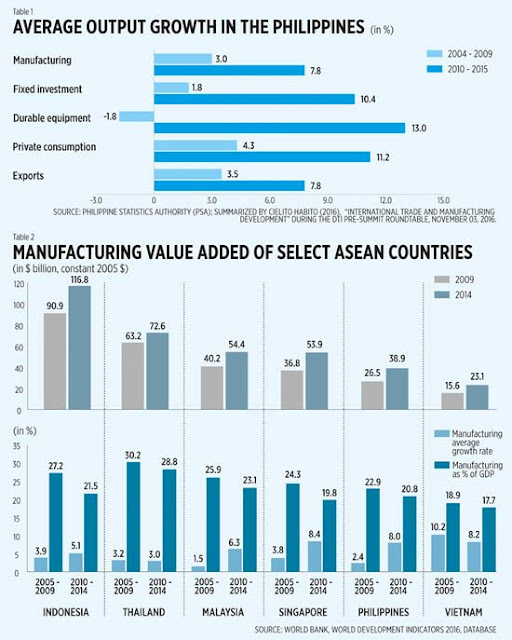 What happened to Philippine manufacturing by 2010 onwards? Dr. Habito showed this data (see Table 1). 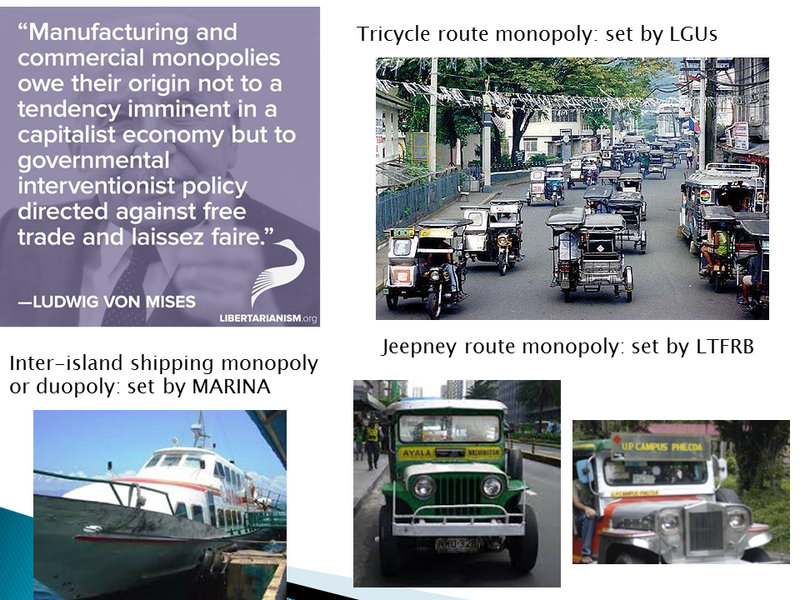 Philippine manufacturing did not weaken nor did it die with freer trade. From an average growth rate of only 3% per year in 2004-2009, it went up to an average of 7.8% per year from 2010-2015. Other sectors -- fixed investment, durable equipment, private construction, exports -- also showed faster growth rates under a freer trade regime, about three to four times faster than average growth in 2004-2009. Ciel also showed slides where Philippine exports have moved up the value chain. For instance, the Philippines exported around $200M of boilers, nuke reactors, machineries, optical, technical, medical apparatus, etc. to Indonesia in 2013 alone. As we moved to freer trade, to zero tariff, our manufacturing and exports became more dynamic, more competitive, more job creating and more forex-earning. One may also credit the past Aquino administration for keeping with trade liberalization agenda compared to its predecessor Gloria Arroyo administration. 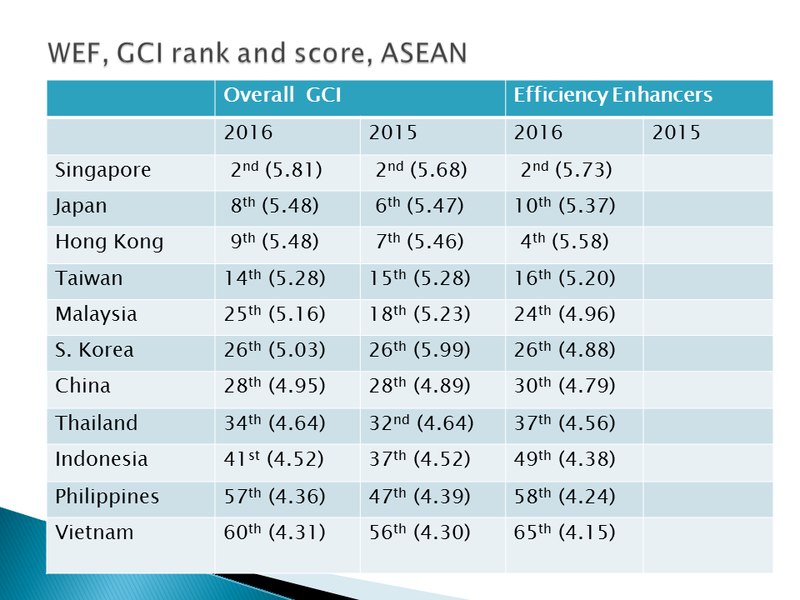 Freer trade benefitted not only the Philippine economy but also almost all other ASEAN countries (see Table 2). One, the size of manufacturing output of the six countries have expanded significantly in just five years. The Philippines’ has grown from $26.5B in 2009 to $38.9B in 2014. Two, in terms of manufacturing annual growth rate, Malaysia, the Philippines, and Singapore experienced faster growth rates while Thailand and Vietnam experienced slower expansion -- but they nevertheless reported growth. Three, manufacturing as percentage share of GDP has declined for all the countries above. This is not something to be taken negatively because almost all countries have shown this trend, with the declining share of agriculture and manufacturing and rising share of services. 1. The government should help improve the economy’s competitiveness. Very often it is not “what government should further do” but rather, “what government should NOT do and intervene,” like fewer taxes, regulations, restrictions, and bureaucratic processes. 2. 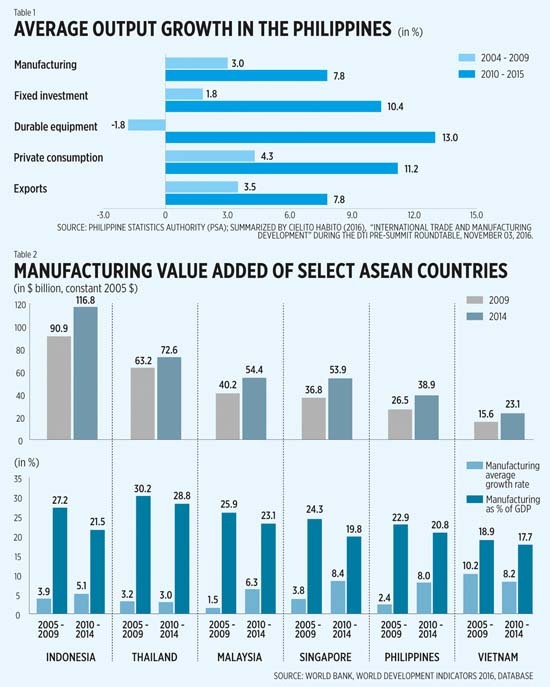 Some factors that deter more investments in manufacturing in the country are outside the scope of DTI, like expensive and unstable electricity supply, slow Internet, poor infrastructure. More competition in these sectors should be encouraged. 3. There are winners and losers in free trade, there are also winners and losers in protectionism. Overall, there is “net gain from trade” while there is net loss under protectionism. Tables 1 and 2 above have shown and quantified some of these gains, so we should never backtrack from further liberalization. 4. Over the long term, we should consider adopting unilateral trade liberalization, one-way free trade policy, both in tariff and non-tariff measures (NTMs), and ultimately in services too. Hong Kong and Singapore are good examples of unilateral liberalization regimes, their exports of goods and services are much larger than most countries in the world despite their small population. 5. NTMs as indirect barriers to trade should be relaxed through time and ultimately abolished. The main purpose of trade policy should be consumers protection and empowerment, to allow the local consumers to have more choices in buying and selling, to have more access to more markets and economies abroad. Bienvenido S. Oplas, Jr. is the head of Minimal Government Thinkers and a Fellow of SEANET. 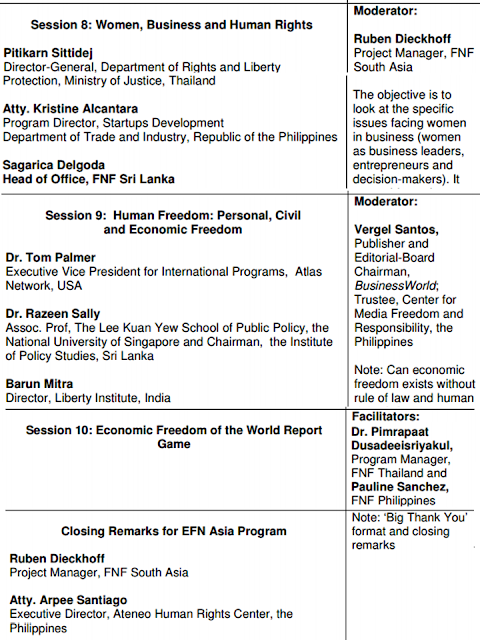 Both institutes are members of the Economic Freedom Network (EFN) Asia. Posting with permission Dr. Josef "Jop" Yap's take on the recent US elections. The images are my addition, not part of Jop's paper. My brief comments after his article. Many are stunned and dismayed by the victory of Donald J. Trump as President of the United States. He was a severely flawed candidate, the Republican Party was splintered, and he was behind in the polls. However, Trump actually obtained less votes than Mitt Romney did in 2012 and is barely ahead of the 2008 total of John McCain. In other words Trump did not win the election; it is more accurate to say that Hillary Clinton lost the election. Another way of putting it is Trump did not break through the Clinton firewall of electoral votes, the latter crumbled under its own weight. Comparing her performance with that of Barack Obama, there was a pool of anywhere between 5-9 million voters that Clinton was not able to motivate to go to the polls. As a matter of fact, the voter turnout in 2016 was the lowest in 20 years. Based on the analysis of FiveThirtyEight and my own rough calculations, if only 1 million of these potential voters had cast their vote for Clinton, she would have handily won in the Electoral College. The question is what prompted the 5-9 million to not vote? A significant number of the non-voters are likely members of the Bernie or Bust group. This can easily be verified by an appropriate survey. For instance a national exit poll suggests more young adults in 2016 than in 2012 “supported a third-party candidate, did not vote for a presidential candidate, or specifically chose not to answer this poll question,” according to the Center for Information and Research on Civic Learning and Engagement (CIRCLE). It is evident that supporters of Bernie Sanders were miffed by the contents of emails related to the 2016 Democratic National Committee leak. A collection of DNC emails leaked to and subsequently published by WikiLeaks on July 22, 2016 prompted the resignation of DNC chair Debbie Wasserman Schultz before the Democratic National Convention. There was palpable tension during the convention and this adversely affected party unity. Subsequently, cybersecurity firms and American intelligence officials stated "high confidence" that Russian intelligence services were responsible for the leak. There are other reasons that discouraged potential Clinton supporters from voting, e.g. a weak message, the private email server controversy, and voter suppression. However, Americans, including Trump supporters, should be very concerned that the Russian intelligence played a crucial role in the outcome of the election. 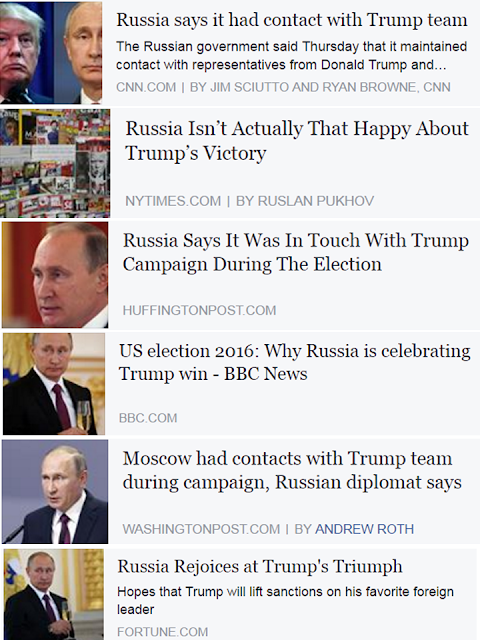 At the very least this gives some credibility to Clinton’s claim that Trump is a puppet of Vladimir Putin. I googled "Trump and Russia", I chose these six stories from page 1 or top 10 news of google on the subject. Why these six, well I believe they are among the world's biggest media outlets. I told Jop that while I subscribe to his suggestion that the low voter turn out especially from the Democrat side was a big factor for the HRC loss, I disagree with his conclusion that Russia and Putin have a big hand in Trump's victory. Especially this sentence, "this gives some credibility to Clinton’s claim that Trump is a puppet of Vladimir Putin." That's putting too much credit to the Russians even if they do not deserve it. Like the PH left giving too much credit to the US government for the Marcos downfall in 1986. These guys are not sooo bright and American voters, Filipino voters, are not sooo lousy as one may assume. 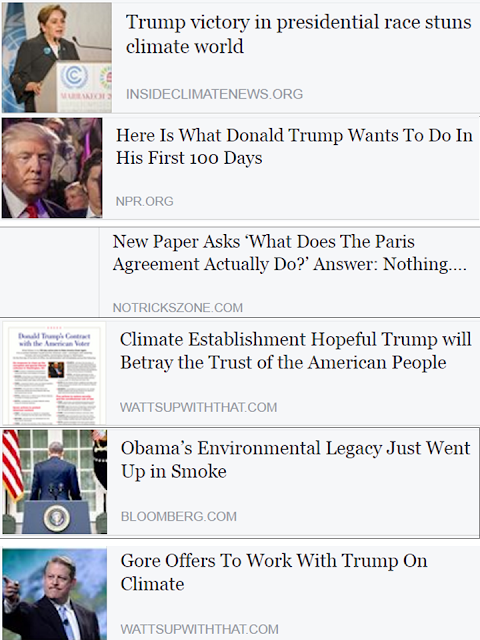 I believe that Trump's climate and energy policies -- more fracking, more shale gas and oil, more clean coal, opening of Keystone gas pipeline, etc. -- these are sure fire measures to flood the US and global market of more oil, hence cheaper oil, and hence more economic misery for Putin and Russia. HRC would be a good ally for Putin because the lady is for more expensive energy via continued renewables cronyism, more energy subsidies, unfriendly to fracking, etc. Let us assign 2 million votes to each of these factors, which is not a strong assumption. The Russian influence is reflected in item . Yes it is not big but it is crucial in the sense that only a million votes would have tipped the election in Clinton's favor. Hmmm, Jop got a point there. It is possible that Putin is unhappy with Trump's cheaper energy policies but happy with his non- or less-combative foreign policies towards Russia, the pains from the former are lower than the gains from the latter. I do not have enough information to confirm or question this hypothesis but for now, it sounds plausible. Anthropogenic or "man-made" climate change (CC) hypothesis is actually 5% climate science and 95% political science. A realistic view is that CC is natural (ie, 'nature-made') and cyclical (warming-cooling-warming-cooling...). So a change in political leadership of one of the major players will significantly increase the % share of real climate science and reduce the share of political science. Some big news reports a day after Donald Trump was elected as the next US President. 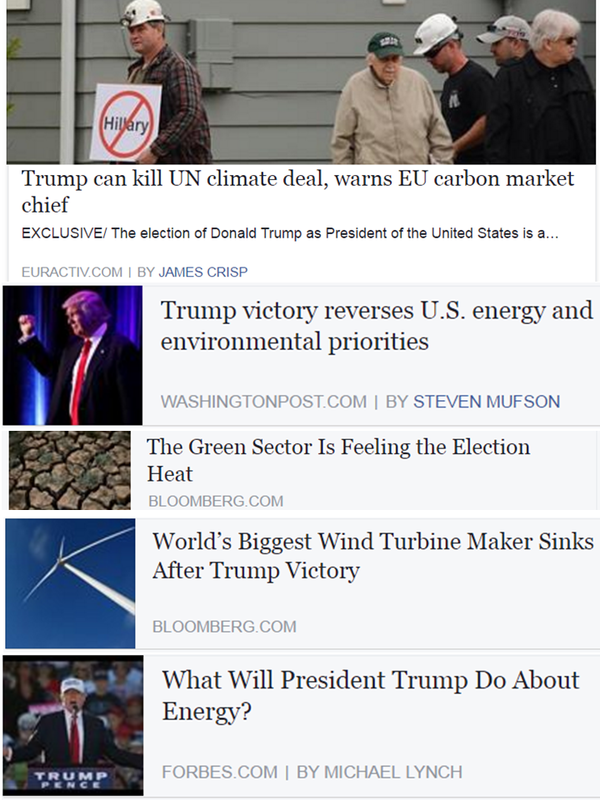 "Shares in Vestas Wind Systems A/S plunged after U.S. voters unexpectedly propelled Republican nominee Donald Trump to the presidency, sparking concern that the renewable- energy industry will face future political headwinds. 1. U.S. withdrawal from the UN Framework Convention on Climate Change, from the Paris climate agreement and from the Intergovernmental Panel on Climate Change. "Many years ago, Lord Monckton predicted America would be nation to lead the world to freedom from the anti-humanist greed of the green movement. Lord Monckton’s prediction has now come to pass. "The US president-elect "cannot prevent the implementation" of the landmark Paris pact, inked in the French capital last December, said Segolene Royal, France's environment minister and outgoing head of the UN climate forum. Their big problem is that hundreds of those "planet saviours" from developing countries, NGOs, etc were paid for by US taxpayers, courtesy of Pres. Obama's embrace of climate alarmism movement. "SEVENTH, cancel billions in payments to U.N. climate change programs and use the money to fix America's water and environmental infrastructure." ★ SEVENTH, cancel billions in payments to U.N. climate change programs and use the money to fi x America’s water and environmental infrastructure." 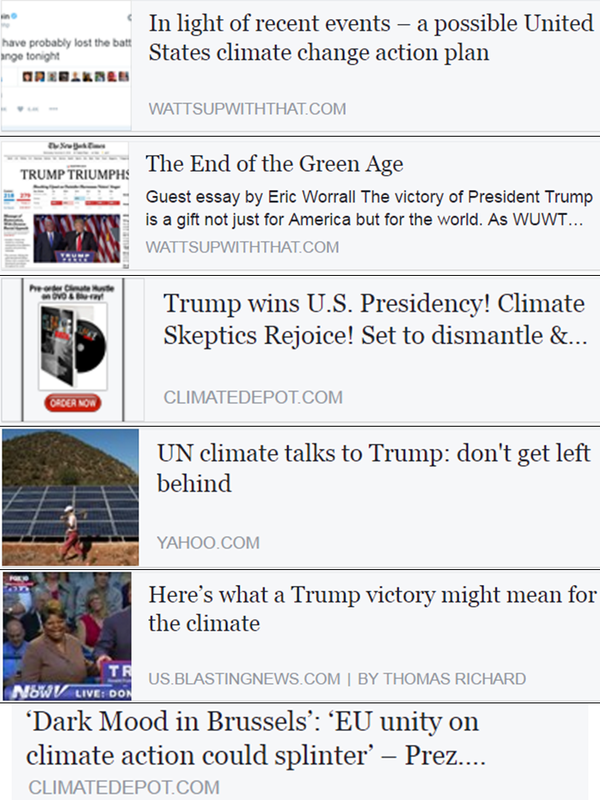 The climate alarmism movement with the goal of more UN, more government, more carbon taxation, more renewables cronyism, more and endless global climate junkets, more climate loans, would be reeling now because the "party might be over soon." More real climate science, less political science. 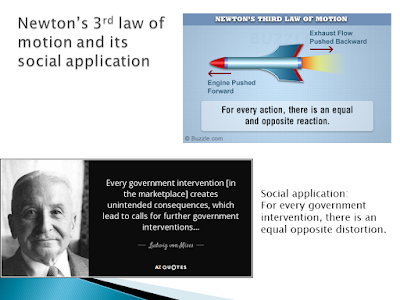 More market in science debates, less government interventions in debate.